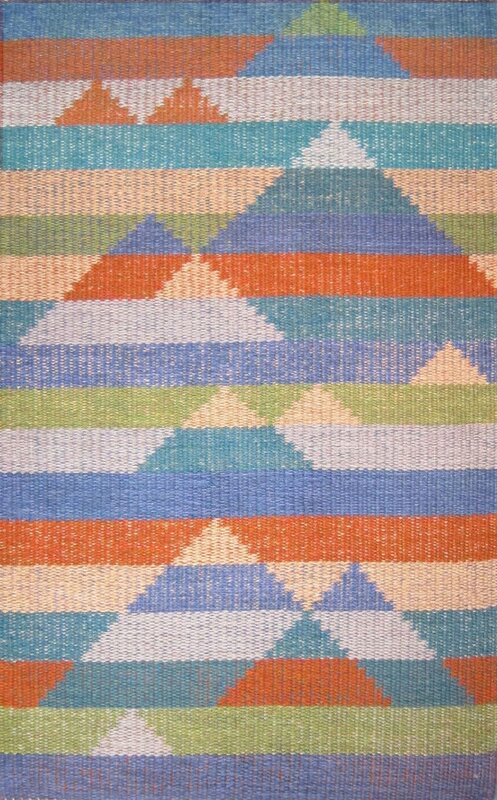 Adding a distinctive hand-woven rug to a room is an effective way to add colour and interest to any interior scheme. Constructed as durable floor rugs, their colourful and decorative style makes them equally appropriate for the wall. 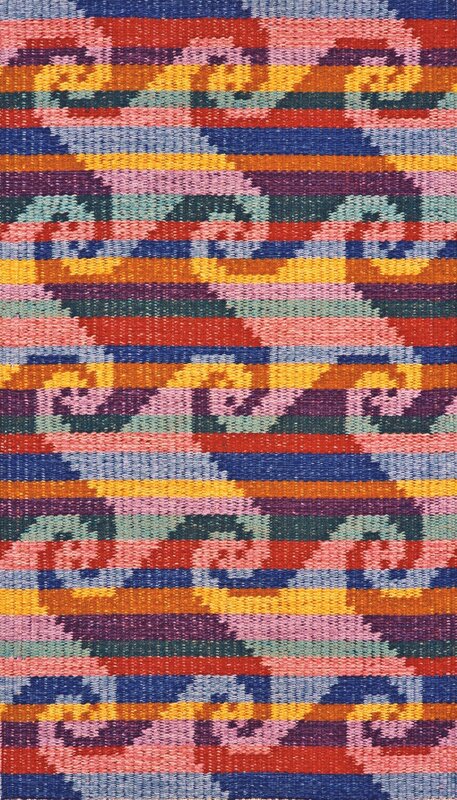 Bold colour and pattern are both strong and distinctive elements of my woven rugs. I use a broad range of coloured wool yarns and blend several strands together, like mixing paint, to achieve the desired result. My recent range of cotton rugs was created by carefully painting the cotton weft yarns with dyes, prior to the weaving process to get the required colour hues and design effects. More details about my rugs / wall hangings can be found on the How To Order page. For information about rugs currently available, or to discuss a commission, please contact me. Wool & linen. Hand dyed weft. Cotton & linen. Hand dyed painted weft. 77 x 135 cm. Cotton & linen. Hand dyed painted weft. 82 x 131 cm. Cotton & linen. Hand dyed weft. Recycled cotton & linen. Hand dyed painted weft. 88 x 162 cm. Wool & linen. 49 x 86 cm. Wool & linen. 114 x 186 cm. Wool and Linen. 112 x 206 cm. JJ0117. ‘Calçada Portuguesa’. Wool & linen. 105 x 101 cm. Wool & linen. 94 x 160 cm. Wool & linen. 112 x 190 cm. Cotton & linen. 110 x 185 cm. Wool & linen. 92 x 152 cm. Wool & linen. 98 x 165 cm. Wool & linen. 87 x 147 cm. Wool & linen. 98 x 160 cm. Wool & linen. 97 x 158 cm. JJ0091. Cotton & linen. 94 x 178 cm. Wool & linen. 108 x 163 cm.